Ben Carson's endorsement of GOP front-runner Donald Trump came as something of a surprise. The retired neurosurgeon's sedate, faith-based brand of conservatism clashed more than once with Trump's brashness on the campaign trail. "There are two different Donald Trumps: There's the one that you see on stage, and the one who's very cerebral," Carson told reporters. But Carson's now suggesting there might be more to Trump than insults and bluster. He told The Hill a private conversation with Trump convinced him Trump "could listen to other people, that he could change his opinions, and that some of the more outlandish things that he's said, that he didn't really believe those things." 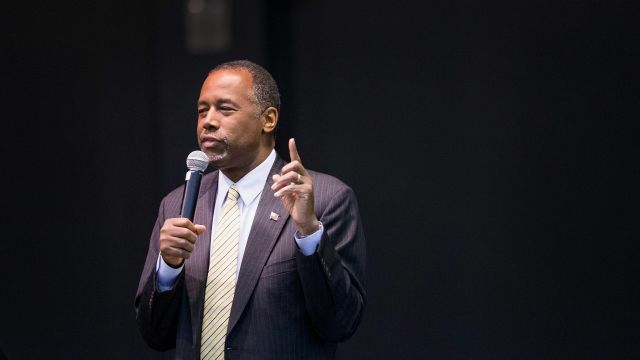 Carson, who officially left the presidential race last week for a job with a Christian voting organization, also said his endorsement was based on simple electoral math — he doesn't think Sen. Marco Rubio or Ohio governor John Kasich can win the primary, and he doubts Sen. Ted Cruz can secure enough popular support to win a general election. Trump has previously mentioned Carson will play a big role in his campaign but declined to go into specifics. Carson has been floated as a possible vice presidential candidate for Trump in the past, but so far, Carson hasn't commented on that speculation.